I haven’t rambled about my favorite actor in quite some time, so now I will. This movie is fluff, for sure. Nice sticky sweet fluff that makes you feel a sugar high before crashing to the floor. It’s unrealistic, as most romantic comedies are. Waiting so many years, checking every book for the phone number, actually finding the phone number…it’s never going to happen in reality. And if it was going to happen, it would not happen just before the both of them were going to get married. But it did, and it made me momentarily happy. He is not the star in this movie, but he is in it and it’s a good movie. This is a great great movie. If it was not, it would still have John Cusack, in 2000 AD, cataloging records and making mixed tapes. Can you still buy blank tapes? I am going to go and make you one right now. Oh, he thought about cheating, but he didn’t. I love when he says, repeatedly, “If it pleases the court….If it pleases the court” It pleases The Pilver, John, it really does. I hated and loved this movie equally, and I don’t want to talk about it ever again. We love it because of the lines Lane Meyer gave to us. Lane is definitely a giver. 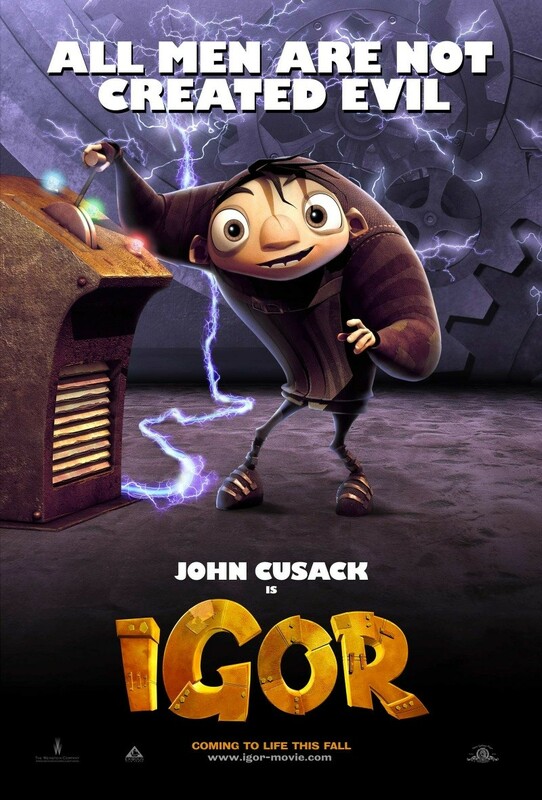 It’s John, as an animated Igor, set out to change the way scientists go about treating the little guy. The concept is award worthy and spectacular, I cannot wait until it’s release. Cross your fingers that there is a midnight showing so I can avoid waiting that much longer! OOOHHHH! I got you good. Of course Lloyd Dobler would be on top. The perfect man who exists only in this modern fairy tale. The guy who ruins it for every other teenage boy who lived in the decade of greed, because they could never match up to the picture of perfection he created for every teenage girl who saw this. This entry was posted in Baseball, Blogroll, entertainment, family, health, how to, Life, movies and tagged John Cusack, lists, movies. Bookmark the permalink. Talk about what? What’s a film? The Pilver who? No love for Gross Pointe Blank? I love that movie! John Cusack and Dan Akroyd as hitmen? Classic! I must concur with Dan . . . Gross Pointe Blank is an absolutely incredible movie and Mr. Cusack actually expands upon his standard character with this one . . . incredibly funny . . . please, sir, make a top ten and include this one! i, too, 3x ❤ john cusack. i watch cubs games just to see him in the crowd. they always zoom in on him. Wow, it had to be tough to keep it down to only 7 picks. I would have a hard time not including Identity, One Crazy Summer, and The Sure Thing on a list of his top movies. I have no idea what you would leave out though, these are some great choices! 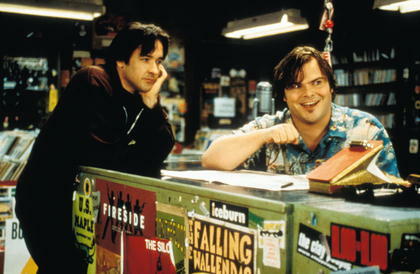 when i saw the igor movie as the number one i got really confused… i was thinking isn’t krissy obsessed with say anything.. hmm maybe that wasn’t him in it… i sat and thought no i’m pretty sure it was him… glad to see say anything is really your favorite jon movie. Yes, but what is your LEAST favorite JC movie? Might I offer up the THRILLING flick 1408? Horrible. And I love John AND Stephen King….but I just can’t give them props for that one. For some reason, ‘Say Anything’ never spoke to me, but most of the women in my life recall it fondly. They’ve never been able to explain its appeal to me, either. They just shrug helplessly and get that dreamy look in their eye that means they’ve gone somewhere internally where no other man may compete with Cusack. Kinda like I do when thinking about his sister. 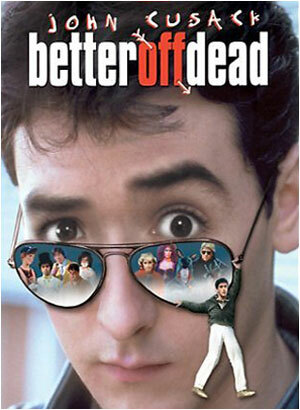 john cusack is simply delicious. try “pushing tin” . i really think i’d cheat on the hubs after seeing him in that movie! Um. Ummm…a John Cusack top 7 movie list with NO MENTION of “Gross Pointe Blank”, “Identity”, or “CON AIR”?!?! And “Being John Malkovich” is only #3? 6 1/2 out of 7 stars. doho- I have no idea, what? Who are you working for? To all who mentioned GPB, yes, I should/could have easily included that one, I just have not seen it in so long. Must repair that problem soon. Christian- I love your visits here, how is school? Will I see you in classes soon? tg- you know you loved Say Anything, despite the faux look of discontent when I put in the VHS tape. 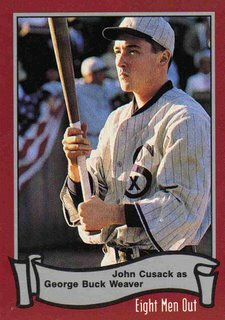 Great list, Eight Men Out is the lost Cusack movie, and one of the best movies about baseball ever. But Serendipity? I am so sad I’ll never get back those two hours of my life. Instead, as others mentioned, Grosse Point Blank, or Runaway Jury as #7. It might be the best John Grishim (sp?) film out there, in part because of our boy JC. You’re right “Say Anything” ruined every romance I ever had after I realised there was no way that guys like that walk the real earth – especially in the 80/90’s and especially in Australia!! Nestor- I could add more, but I needed the fluff in there somewhere. 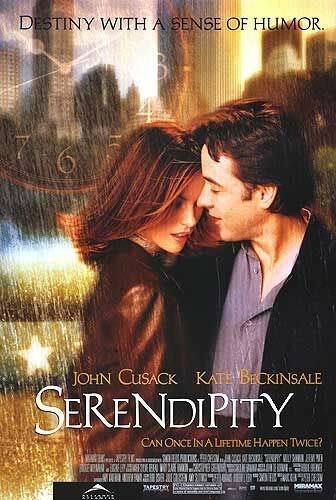 As sticky sweet as it may be, I’ve always been a huge fan of “Serendipity.” Maybe it’s Beckinsale’s accent that does it for me. I even read “Love in The Time of Cholera,” thanks to that movie (the book in which she writes her number). And David Gray wrote the music used in the last scene. All good stuff. Okay… you had me going for a sec… I was going to be really upset that say anything wasn’t even on there. 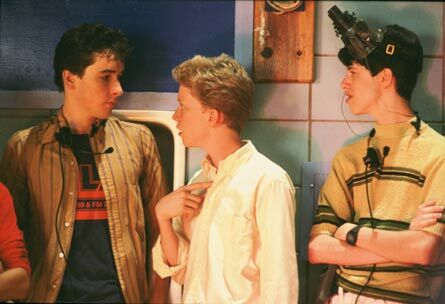 Hit my blog up for my top Five Cusak movies… (ps thanks for the blog idea:) ). did i mention i love John Cusack…?